I was quite pleased with the color images in my previous post, especially given that they are from negatives over 30 years old. However, when I made prints for a print critique session, I was surprised by everyone's reaction: “Make them in black and white.” The subject is the stones, their forms and textures, they said, not the color. So I made a black and white version of each, which you see here. Quite a different feeling in black and white! Why is that? This is what I think occurs when viewing black and white photos. By removing color, an image is one step removed from reality. It is partially abstracted, and the viewer reacts differently to the image because of this abstraction. With black and white, the viewer's imagination plays a bigger role, much like the way a radio drama can engage the listener's imagination in ways that television can't. I still like the color versions, but for me the black and white versions have a stronger impact. They are mysterious and mystical. To put it simply, the color image is closer to what I saw when I was there; the black and white is closer to what I felt. What are your thoughts? Which version do you like better, the color or the black and white? Why? Here are two shots I’m including in my March 13 presentation, Beyond Stonehenge – Rock Stars of the Neolithic Era. 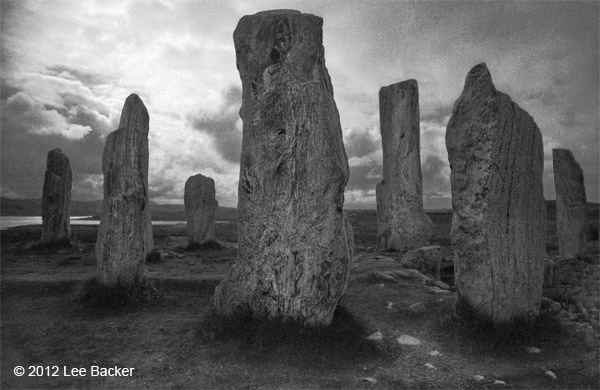 These are the Callanish Stones in Scotland on the Isle of Lewis. In their own way they are as magnificent as Stonehenge. Yes, it's another scanned image, this time from a 35mm b&w negative taken in 2000. I have lots more images to scan, but my resolution for next year is to post new work as well. Next year promises to start out busy. I am currently preparing for a photo presentation of megalithic sites in Europe, including the photo above, to be given in March. Also, as a member of the Soho Photo Gallery, I am participating in an exhibit along with several other members at the Red Filter Gallery in Lambertville, NJ. As the sun sets on 2011, I want to wish everyone a happy, healthy, and joyous 2012. Here is another discovery I made while sifting through decades of my old slides. I found slides of Milford Sound in New Zealand from a trip in 1989. Rain-drenched mountains rise steeply from the water, with clouds swirling above them and below. How uninteresting these photos would have been if the sun were shining! They would have been ordinary postcard shots. The dyes in many of these slides had partially faded, leaving an uneven magenta or blue cast to them. Since they were almost monochromatic, conversion to black and white seemed the way to go. Four images are in the Milford Sound, NZ gallery on my website. I began a project this year that I've been meaning to do for a long time. I have begun to scan my archives of 35mm film into my computer and convert them to digital images. I began photography around 1969 and didn't maintain a consistent filing system for negatives or slides. Many slides remained in their original yellow boxes from Kodak. So I knew I was in for a long, slow journey viewing forgotten images. I have made some amazing discoveries along the way. One wonderful discovery is from slides taken on a 1973 trip to Iceland. For the most part the color quality has remained good, with little or no fading from the old Kodachromes. I find these old images still appealing: buildings situated in remote landscapes; water tumbling over rocks so new they show few signs of erosion; fishing boats in and out of the water. On this trip, I spent one day at a whaling station in Hvalfjörður, arriving just as a whale was brought in for butchering. The stench was overwhelming, and I could not understand how the workers could do their jobs with such a foul smell constantly in their midst. I have added eight of these Icelandic photos to the website. Before digital, making prints from color slides was always a difficult and expensive process for me, with unsatisfying results. I never attempted color printing in the darkroom, but now I can finally make images from slides that brings out their full potential.